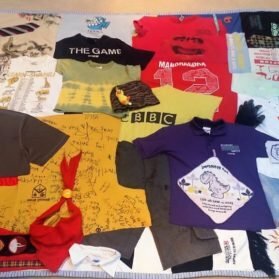 Mark had been squirreling his daughter’s clothes away for a number of years, so it was a huge exciting surprise for their mum to be given this memory quilt from them all on Christmas morning. Such a sweet thoughtful gift. 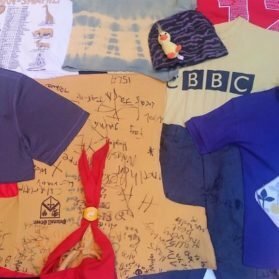 Marks daughter’s clothes stitched into a memory quilt. Emma asked me to stitch a quilt for a friend using some cherished curtains made by their mother and a vibrant film poster as inspiration. 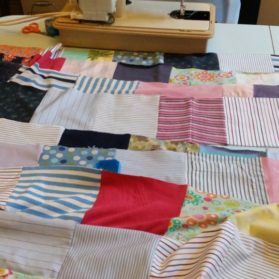 Following several e-mails to finalise the quilt design, I got to work. 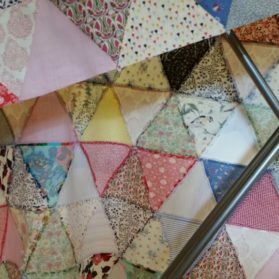 The resulting quilt is vibrant and cheery and channels the autumnal colours on display while it was being stitched. Yvette got in touch to ask me to stitch a quilt for her daughter’s 18th. 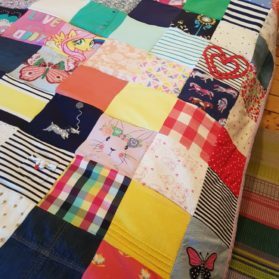 Included in the quilt are her daughter’s clothes (plus dad’s stripy shirt&mum’s spotty trousers) and lots of stripy fabrics as her daughter loves stripes. Yvette said; The quilt is gorgeous. Thank you so much Lisa. You’ve woven wonders from a bundle of old school shirts, toddler dresses and baby-grows. It’s been a brilliant way to capture memories of our daughter’s childhood – and give her something beautiful to keep for ever. Thank you so much for pulling out the stops to get it done in time for her 18th. 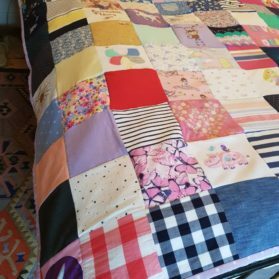 Kate wished a quilt to celebrate her mum’s 70th birthday using memorable fabrics supplied by family&friends. 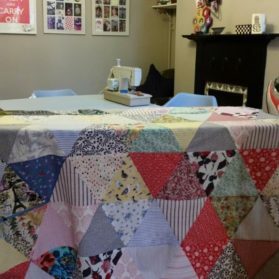 Kate chose the distinct triangular patchwork design and advised on the fabric distribution&selection; Dear Lisa, I just wanted to write and say a proper thank you for all you did to make my Mum’s 70th birthday quilt so wonderful. The end result is so much more beautiful than I had ever hoped and so amazing, especially considering how a lot of the fabrics I supplied were far from ideal. I also very much appreciate how kind and flexible and helpful you were throughout the process. 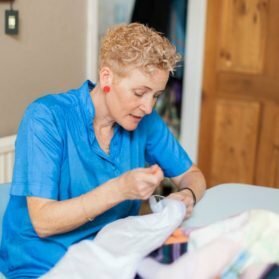 Collecting fabrics from all of my mum’s friends and family was quite stressful one way or another so it was really great, life saving in fact, to then have you taking over and working on making such a special piece. 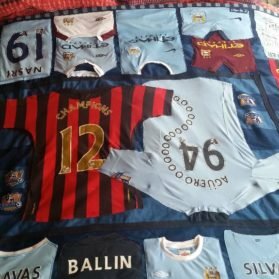 I can not wait to give my mum the quilt. I will be taking lots of photographs and sending them to everyone that contributed as everyone is really excited to see it and to see my mum’s reaction. 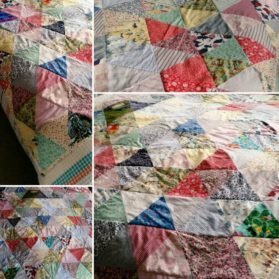 For me, this quilt is a present my mum can have with her reminding her of everyone that loves her, keeping her warm and making her smile until the end of her life. It couldn’t be more special to me and I’m so, so grateful for how lovely it is. Thank you Lisa. The back as delicious as the front! 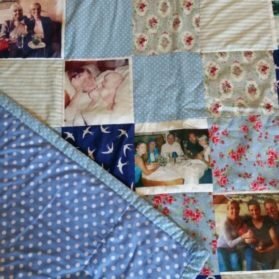 Annelie wished a quilt for her mum to cuddle up in that wrapped her up with images of her family. 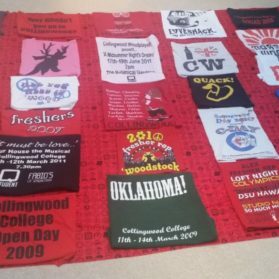 Alex wished me to stitch her a colourful quilt with all her sweatshirts and T-shirts to remind her of her fun student days at Durham University; When I approached Lisa about making a quilt out of all my old university clothes I had no idea what to expect. Throughout the process from initial consultation, through to design and final production, Lisa was exceptional. 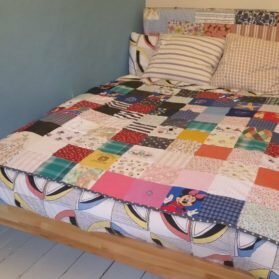 She made a real effort to really understand what I wanted to achieve with my quilt and managed to pull together all of my treasured memories in such a stylish way. 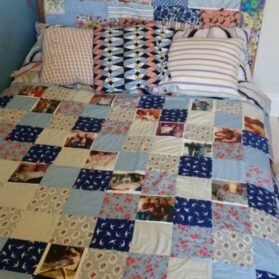 I would have no hesitation in recommending Lisa for a bespoke quilt commission – you can be sure your memories are in safe hands. 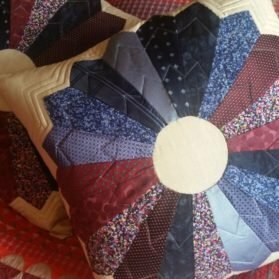 Susan Harrison contacted me to stitch two Dresden patchwork quilt cushions for her mother using some of her late father’s ties. 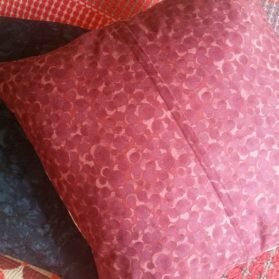 Following discussions on colour and design I stitched two traditional with a contemporary twist cushions. Susan tweeted; Thank you @lisawatso for fabulous cushions incorporating my Dad’s ties. Mum is delighted! Chrissie Harrison then sweetly e-mailed; The cushions made from my husband’s ties arrived recently and I am delighted by them. They remind me of many happy occasions when he wore the ties. Thank you so much. 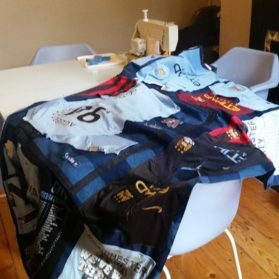 Betsy got in touch to stitch a MCR City football shirt quilt for her teenager son; Max. The family came for a quilt consultation and we decided together on a design and what fabrics would work best for Max’s quilt. 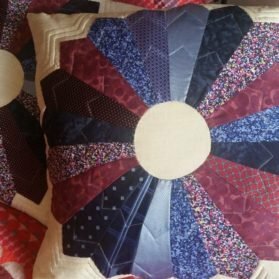 I really enjoyed this unique stitching challenge. 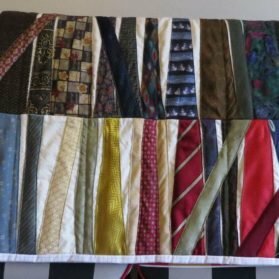 Debbie wished to use all of her father’s amazing collection of ties to create a comforting quilt for her mother, who has just moved into a new flat closeby to Debbie after selling her martial home. 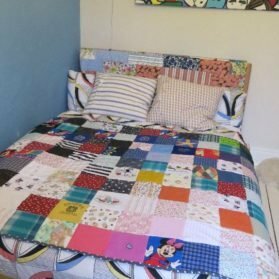 Every single tie has been stitched into this quilt to create an eyecatching design. 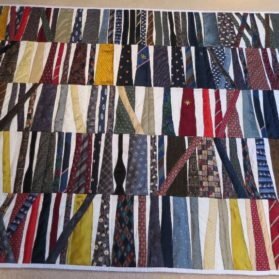 The quilt has been backed and binded in shirting fabric to link in with this tie quilt. 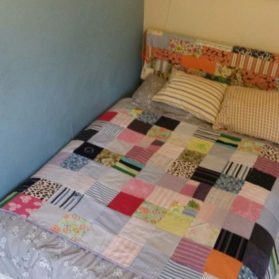 Here is what Debbie said; Thanks again for the beautiful Quilt, pride of place on mum’s bed. The death of your life partner is devastating, but for Mum, downsizing from the house she had shared with Dad, to a flat for one, was a painful and difficult process. When she gave me a bag of Dad’s old ties that the felt she could not keep, I realised what a strong reflection of his life they were. In the bag were ties from school, university, professional and personal aspects of his life. There were ties that I could clearly remember him wearing to important family events. When I discussed them with Lisa she used her wonderful artistic flair and intricate practical skills to create a true work of art. 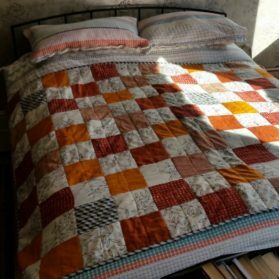 The quilt is both a psychological and physical comfort and is undoubtedly now a wonderful keepsake and remembrance of my dear departed Dad. Thank you Lisa. 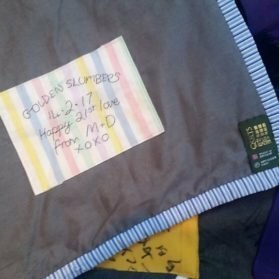 Angela added; Thank you for the wonderful quilt incorporating Noel’s ties. It gives me joy on a daily basis. 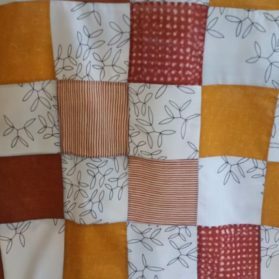 This quilt has been backed with shirting fabric. 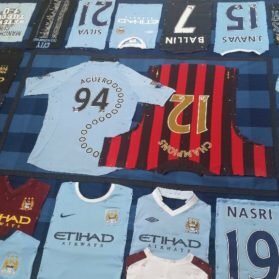 A unique tie patchwork throw. 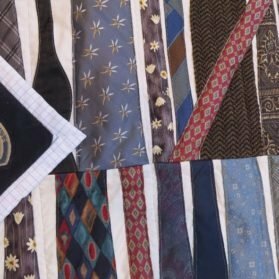 The whole of Noel’s tie quilt. 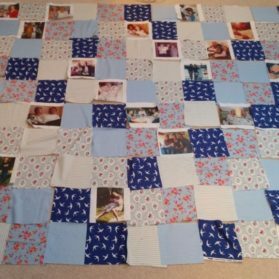 Elaine brought all her daughter’s baby and childhood clothes, as well as some of her maternity dresses to stitch into a comforting memory quilt for Charlotte who has just started studying medicine at Oxford University (WOW!). 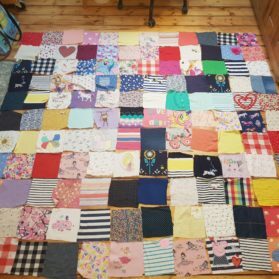 Elaine really wished as many fabrics as possible to be stitched into Charlotte’s memory quilt and I think we have succeeded, don’t you? Elaine wrote; Charlotte’s face was a picture when she saw her quilt for the first time on Christmas Day. She absolutely loved it and thought the mixes of colours and patterns were brilliant. 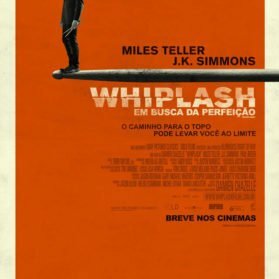 Everyone who has seen it thinks it is beautiful and a really thoughtful idea. 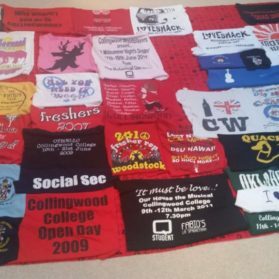 Charlotte’s quilt now has pride of place on her bed at Oxford University! 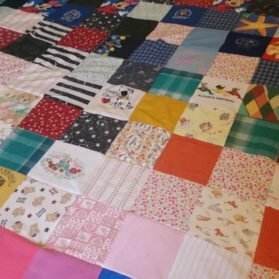 Thank you so much for making Charlotte’s quilt for us. We are delighted with it and it has brought back some lovely memories. 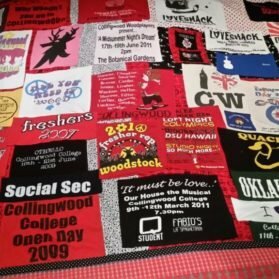 If you are interested in Lisa stitching you a personalised unique quilt, do click Bespoke-quilt-info for further details.